Mark in his QPR strip. As an amateur boxer, Mark Lazarus favoured the art of defence and ring generalship. As a footballer, he was definitely more of a reactionary spirit. In his era, the leather football soaking wet and caked with mud was comparable to a medicine ball, and heavy tactics were entrenched in the game. Mark was a right-winger who took intimidation in his stride and, as a result of his hard-running and fearless approach, together with his instinctive propensity to outwit the fullbacks, cut in and score goals, he became one of the most sought after players in the country. 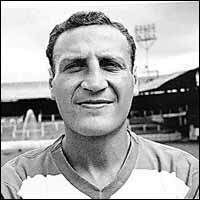 During his 20 year professional career, Mark made 606 appearances in total and scored 151 goals. He played for Leyton Orient, Wolverhampton Wanderers, Brentford and Crystal Palace, but his true love was Queens Park Rangers, for whom he played 206 times and put 76 balls into the back of the net. 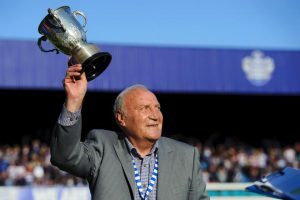 He completed three separate stints for QPR, during the third of which he scored the winner against West Bromwich Albion in front of a crowd of 100,000 at Wembley, ensuring that Rangers became the first ever Third Division team to win the Football League Cup. In the QPR locker room. 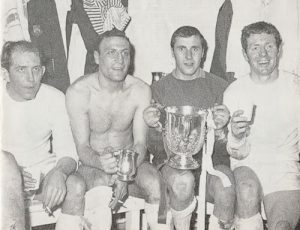 Mark and his team mates with the Football League Cup. Mark acknowledges the cheers from the terraces at the 50 year celebration.